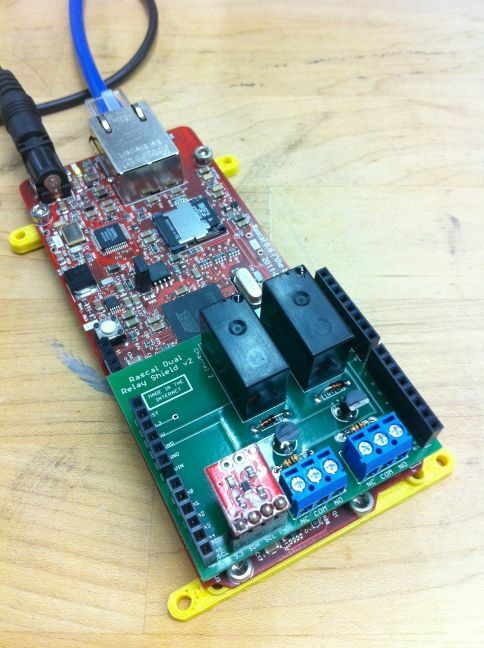 » Rascal/Arduino Dual Relay Shield v2 Mike Goelzer's Very Occasional Blog. Dual Relay Shield v2 (green thing on top) connected to a Rascal 0.6 (red and yellow thing on bottom). The DRS lets you switch 2 relays on and off to control devices up to 5 amps at 220 volts. The shield has two relays that can switch up to 5 amps — this could be a pair of lights, motors, speakers, etc. It also has an integrated I2C temperature sensor. You could use this to build, for instance, a web-based thermostat. I expect Brandon will set up a Rascal demo or tutorial using the shield in the near future, to which I’ll link from here once it exists. All of the design files are open source. You can find them on my Rascal Shield github.